The restaurant can accommodate large parties. Please call for details. 62 years of loyal customers can't be wrong. We are grateful to all of our customers, employees, and critics (...though we may not always agree!). The only way to find out the truth is with a visit. Oft imitated, never duplicated. Thank you in advance. carved at your table, to your specifications, from our unique stainless steel serving carts. we serve only the best beef available, the top 2% of all beef marketed. although this incurs additional expense, our mid-western corn-fed beef aged for 21 days, is the most tender, juicy and flavorful beef available. a smaller cut for the lighter appetite. a hearty portion of juicy, tender beef. some feel that a thinner slice produces the better flavor. 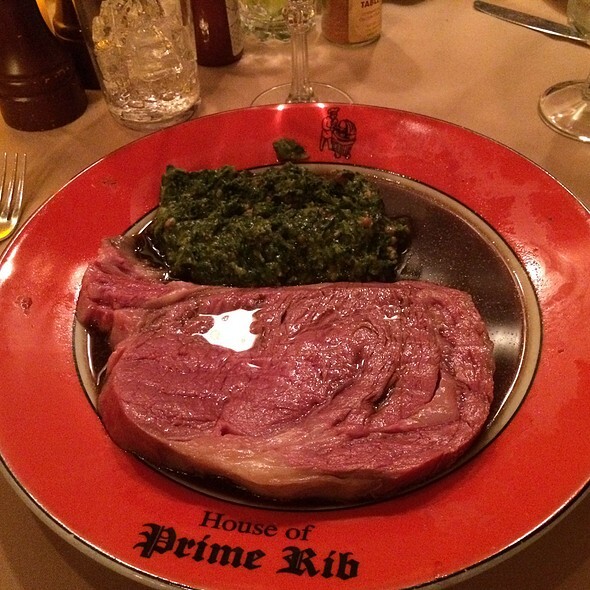 extra-generous, thick cut of prime beef, for king size appetites. ask your server for today's special catch and price. included with prime rib dinners. a colorful mixture of healthy, crisp, seasonal greens prepared at your table, tossed in our unique house dressing. a generous steaming helping of the all american favorite, served with thick brown gravy. 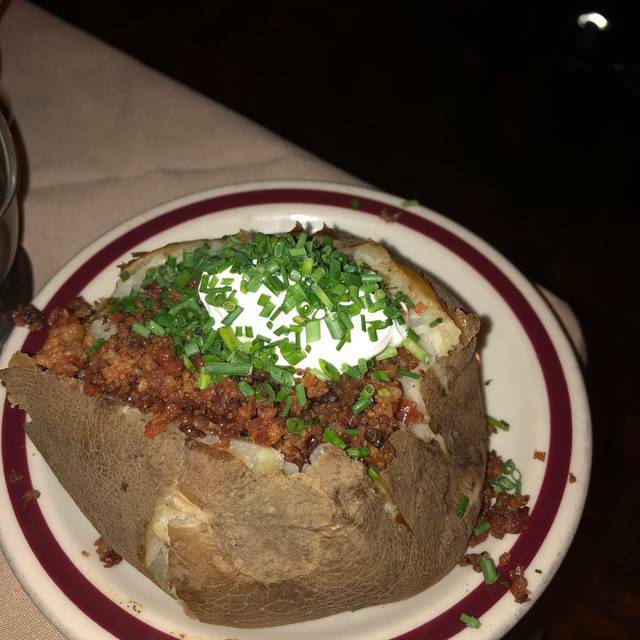 a superior sized idaho potato served with butter and sour cream, with a sprinkle of chives. straight from merry olde england! light, airy batter baked to a golden brown dome, with a fluffy interior to soak up those savory beef juices. A light dish of garden spinach whipped with fresh cream and pieces of bacon. From our dessert cart, we offer the most sumptuous sinful desserts to complete your evening. It was perfect ! Great food ! Yet another excellent prime rib dinner. David was an amazing server - very welcoming and accommodating. A difficult table to get, but always a great time. Thanks to the staff for a fun and delicious evening. We had a 9:00pm reservation. Ambiance improved as more diners left. Chef screwed up our order. Took three attempts to get it right. Waiter was efficient but glib. I personally did not eat anything, except the free snack things, but the wine and martini I got was delicious. The staff was so polite and helpful. That's really what I loved about House of Prime Rib because, again, I did not eat anything, so the staff is what stood out to me. Also, it was very comfortable there. I usually am looking for signs of food on the floor so I don't step on it, I didn't see a single crumb. My only complaint: the women's bathroom was a bit unclean. For such a beautiful restaurant, I was thinking the bathroom would be cleaner. We are lemon drop martini fans so we ordered 2 while we waited to be seated.They were awful. Bitter. What was that lining the rim? Wasn’t sweet. Sadly, we didn’t/couldn’t even finish them. We ordered 2 glasses of the Sonoma Cabernet that were very good. We each had a second glass. Prime rib was divine. That’s what I came for and wasn’t disappointed. However, if you want anything other than prime rib....go elsewhere. Literally, that’s all they offer. Different cuts, but only prime rib. Choice of two different potatoes (baked or mashed), two different sides (creamed spinach or creamed corn), and everyone gets Yorkshire pudding and salad. Salad was cold, crispy and yummy. Everyone gets the same salad dressing. Pretty much that’s it. Our waitress was lovely. Friendly, helpful, gave us extra gravy for the mashed potatoes, very attentive. There’s several “chef’s” on the floor at different carving stations and they pull their carving stations up (sort of) close to your table to carve and serve your plate. Same thing. Every table. Every day. All day. Wow. Again, prime rib was excellent. Whole meal really was. I completely agree will many previous posts. It’s a “get em in and get em out” feel to the whole thing. Don’t come to have a romantic dinner. It’s good for any occasions to be here. Nice food but the portion can be less especially for ladies. Professional servers. Meat and fish cooked to perfection. Never disappointed when we come here. I’ve had better service on a weekend evening. Our server wasn’t very attentive and had offered to bring out an order of mashed potatoes for our toddler “right away” and then forgot. I also asked for the wine list after we had salad served as I wanted a glass with my dinner, she forgot that too. I was last at HOPR 44 years ago, taken there by my mother as a freshman at Stanford, new to California and SF. I can say that nothing has changed, and that is a good thing. A true classic, remarkably hard to get a reservation after being around over half a century. We hiked all afternoon to work up an appetite, and that is an appropriate preparation. The prime rib was delicious as ever. We washed it down with a Turley Zinfandel, which was very reasonably priced for such a nice bottle. The restaurant scene has grown and become very much more sophisticated in 44 y ears in SF, but HOPR joins other institutions like Tadich's Grill in defining the City. I hope it stays there forever. I told my waiter we were there to celebrate my husband birthday he did not acknowledge that I notice a few other party's were there celebrating birthdays they got a desert and there picture taken but we didn't that was very upsetting. Overall food was good. Incredible experience from start to finish! 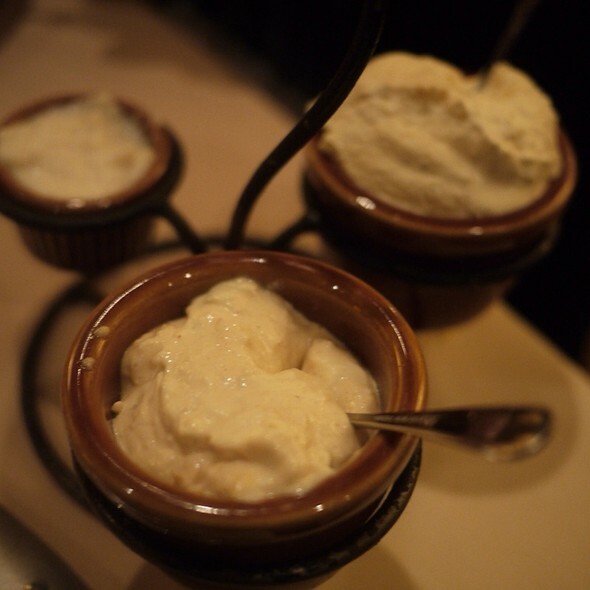 Great cocktails, delicious prime rib plus sides, and decadent desserts. Special shout out to the amazing professional wait staff and cocktail servers - friendly, efficient, and they never miss a beat, all of which makes the meal very special. Noise level is high because of the number of people dining. My husband and I made the reservation more than a month in advance but we kept checking for other better time slot that might have opened up. Finally we got this reservation at 6:30pm on Saturday, which was perfect. Our first impression when walking into the restaurant was that the ambiance was vibrant and every waiter looked very busy. We were seated in a few minutes but the table was in an awkward spot, sort of in between two booths. We thought about asking for another table but didn't because the place looked very busy and didn't want to wait. The food was very good but we couldn't really tell the difference from other good steakhouses. 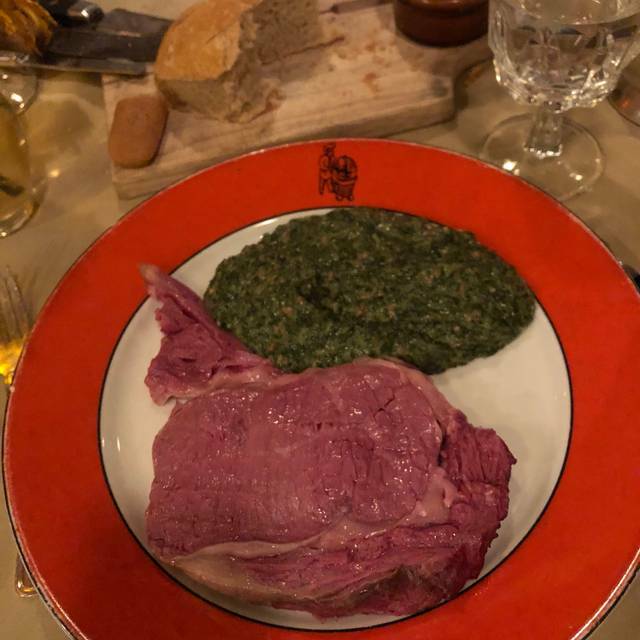 My prime rib was cut with an uneven thickness though. The service was great and everything was done in an efficient manner. The waiter gave my husband a birthday dessert and took a photo for us. Somehow I didn't feel the experience worth the wait and the price. We do our annual birthday dinners here three times a year, we love the atmosphere and the great food and service. Excellent as always. Seated promptly at reservation time. Waiter was friendly and informative (after more than 10 times here, I learned that salad dressing was apple cider vinegar based with egg white). Left with the familiar red bag for the next day. Every time when I am in the Bay area, I will come to this restaurant. Excellent service. The butter corn which is not on the menu is very great! Salad is also amazing that I can finish all of it every time even though I am not a fan of salads. Will definitely recommend to others and come here again next time if I come to San Francisco again. Best part of the meal was creamed spinach! It was great! Always delicious and always consistent! This place is a must if you love prime rib as much as I do. Excellent. 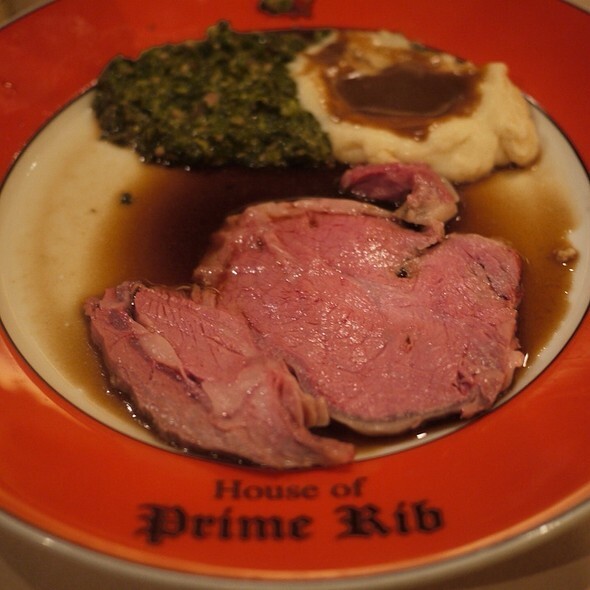 We’ve been going to House of Prime Rib whenever we are in San Francisco. However, sometimes we just make a trip to go there just for Dinner. I would definitely tell my friends to visit House of Prime Rib. This is my favorite place to dine!!! Great food! Great staff! 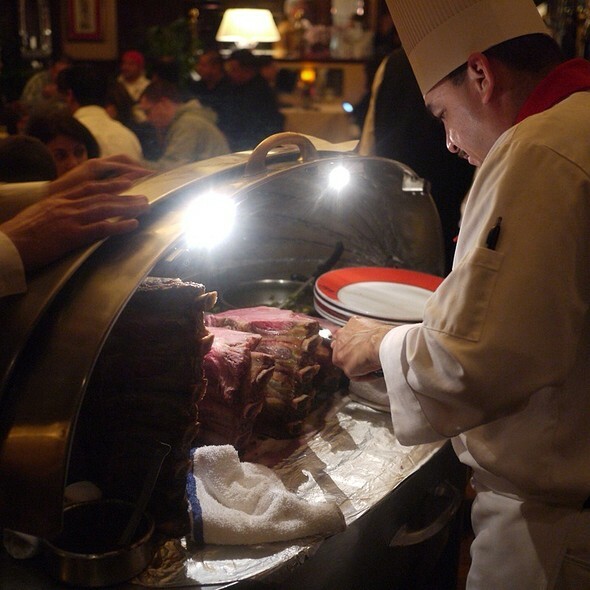 Simply put, the finest Prime Rib dinner on the planet! We celebrated my husbands birthday and our waiter was great! We go to HOPR two times a year or so. Food is always fantastic. We are amazed by the consistency. Bravo! I been to HOPR more that I can count and every time that I've been, I've always received the best service and most phenomenal experience. I took my Bf out this time around for his first time and the service was horrible. Our waiter was rude and inattentive and looked like he hated his job, not to mention he got salad dressing all over my new jacket and did not apologize. We also felt rush as we were talking and still working on our plate. It felt like he just wanted us out. It was not a great experience. This experience alone made me question wether HOPR changed over the years or if it was that single server alone. I'm not sure if I would come back after this experience, especially to a place I once thought so highly of. I continuously apologized to BF and told him that the service is usually better, for his first time, I doubt he'll want to go back. Amazing food fast a still hot. Nobody like getting cold food in a big restaurant. I was afraid of that. Friendly staff, they were all very happy to help you and most importantly, to make sure you were satisfied and full! Did not disappoint. Had not been in 30 years. It was nice to see that the ambiance and decor where still the same as I remember. And of course the food was just like i remembered in my dreams. 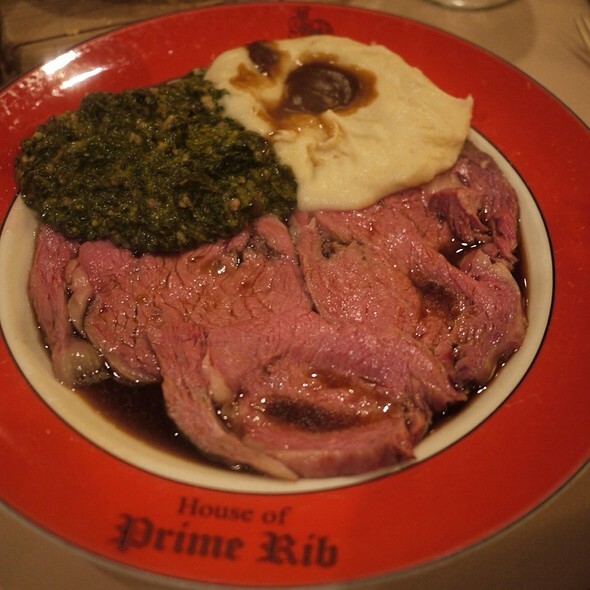 If you are a beef lover, you must experience House of Prime Rib. It is the best. Very large portion, perfectly prepared. Extremely popular, very noisy. Thank you for making my sister 40th bday dinner a blast. We had too much fun at dinner. Classic Prime Rib, as it should be. Nothing more nothing less! Excellent service!! Food was good! A bit too noisy but still acceptable.